On most days you can find Bernie Kosar in his happy place — the Northeast Ohio farm he purchased during his time as Cleveland Browns quarterback. Kosar, who jokingly refers to himself as the Eddie Albert character in the old TV series “Green Acres,” enjoys exploring the land and enjoying the seasons. "When you're able to get outside it really gets the pressure of the cellphone ringing all the time, the texts, the emails, you know, it's a great way to kind of just get away, relax," Kosar said after a Sunday afternoon ride on one of his quads. "You know it's not traditional exercise. But I'll put my boots on and walk up and down the creek or go and make different trails and cutting down trees and clearing out paths… out here with all of this great nature around you, it's just fantastic." This joy at one point in his life, though, was more of a chore, made difficult by the concussion-related complications he had been experiencing. Kosar’s is a life that exemplifies the highs and lows of a life in football. And concussions went along with the job. 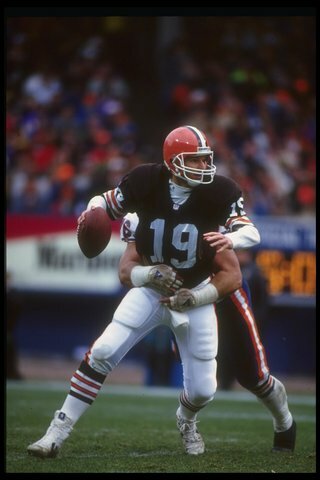 The heavy hits for Kosar began in college at the University of Miami on his very first play from scrimmage in a game against the Florida Gators at the swamp in Gainesville. 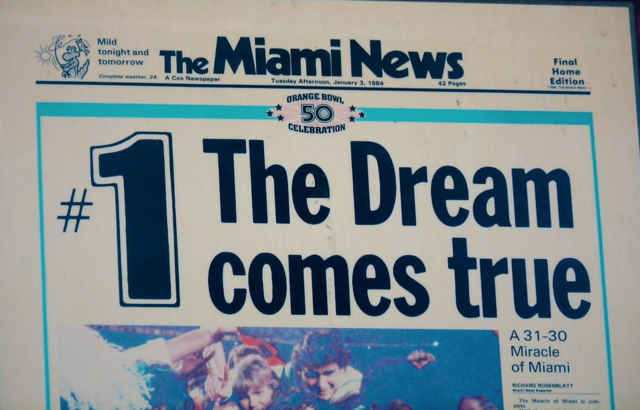 Kosar did very well in school graduating from the “U” with a degree in finance in just 2.5 years while leading the Hurricanes to the school’s first National Championship. He would announce his decision to enter the NFL’s supplemental draft in 1985 to guarantee he would be picked first overall by the team he grew up rooting for in Boardman, Ohio, the Cleveland Browns. For eight and a half seasons on the way to three AFC Championship games, the hits kept coming, said Kosar, who puts the number of broken bones and torn ligaments he suffered at around 60. Quarterbacks at the time didn’t have the protections that exist in the NFL today. "The league was encouraging crown of the helmet, top of the helmet blows. I mean the beginning of Monday Night Football was two helmets smashing together, the pregame show had a segment called 'Jacked Up,' where how hard do you hit a guy and you were glorified for using your helmet as a weapon," he said. Beyond that, the astroturf fields of the day were little more than fuzzy concrete “and in Cleveland we had the mud that got frozen. So frozen mud isn’t exactly pleasant either,” he added. Kosar once famously played three quarters of a game on a broken ankle, it was an era, he said, where you didn’t dare come out of a game. “I had this talk with Marty Schottenheimer. A lot of times I'd get hurt during a game and he goes, 'don't lie to me, are you hurt or not?' And I told him just a couple of months ago, I go, 'Marty, I never lied to you, I was lying to myself.'" He knew the rewards of those days were, in his words, at the cost of the future. But in retirement came the pounding headaches that led to sleepless nights and anxiety that left this man known to a country, at times feeling alone. "I know my family could care less, they didn't believe me, you know, when you say well you're not sleeping ‘oh your head hurts, oh you're just making it up,’” he said. “You know, my own family didn't care, they thought I was embellishing, needed attention." As the symptoms got worse his weight increased and his speech slurred, leading many to believe he’d been drinking. He admits he was in denial until he learned of a doctor in Florida administering a treatment of mega dose vitamins. “I literally within 10 days, two weeks could aggressively feel a positive influence on me," Kosar recalled. “My approach is one of enabling the body’s natural physiology to flourish,” Dr. Pesek said of his holistic care approach that emphasizes a superfoods diet, cleansing and mega dose vitamins to supplement those that have faded in our lives over the centuries. “It’s really us being removed from what our ancestors did,” said Pesek. “You know we're not running around naked so everyone has a Vitamin D deficiency, we're not eating C vegetables like our ancestors and everyone has iodine deficiency." 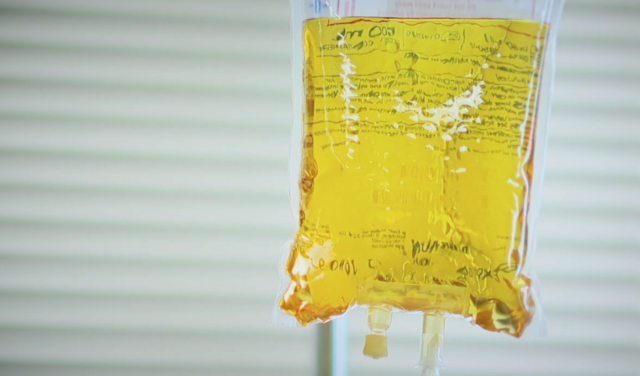 Several times a month, Kosar receives an IV of mega dose vitamins tailored to meet his needs and the outcome for him he says has been remarkable. The concussion-related headaches subsided, which enabled him to again sleep through the night and along with diet and exercise he’s down about 60 pounds and able to fully enjoy life again. “Megadose vitamin therapy is an incredibly underutilized strategy at optimizing health in this day and age,” Pesek said. "Is it the complete answer?” Kosar rhetorically asked. “I can't give you that just yet but I know it's helped me." "Is it the complete answer? I can't give you that just yet, but I know it's helped me." He believes it’s something that might help others in his position as well. That’s why he’d like to see it included as an option for players involved in the NFL concussion settlement. "This is why partially I wanted to do this with you. Letting people know, not just athletes, but specifically athletes now that are going through with this concussion litigation, there is hope out there and, right now, if you don't have hope, you can't really take that next step," he said.